"C'mon now, did you really think this would be that hard? Between me and Hank, you can take the Admiral stars and keep your job. I'm kind of insulted you think I'd pick the guy who is basically Frank Burns in real life over you or let this go downhill." Jack said. "Besides, with something I just had to give on with the IOA, they can do this in return. Well. Among other things. Ian's actually quite fed up with the British and intends to light a fire under their butts tomorrow, tired of their people always dragging their feet and they evidently have control of a US Marine unit. Should be an interesting show." Jack added, "But I seriously don't understand why you fretted at all over this. I mean, unless you want to retire, but otherwise, I get final say on the people in this Command, and I'm not taking that guy. He's seriously like a real life version of Frank Burns, I bet he even does that little giggle to himself." "Thank you Sarah." If anyone around the SGC might even think for a moment that these fine people didn't watch each other's back they were sorely mistaken. The well oiled wheels of the established society within these vast deep walls worked quite possibly better than a Swiss Clock, with everyone knowing when to lift and at the same time know when they could lean just a little. Anne was doing some leaning now, with the fact in her mind she'd be doing as much lifting very soon. If there was one person on the planet she knew who could get things done, it was Jack. Of course there were others including Sam and a list of them. Jack though was a unique being, in as much as he was the type to get things done now rather than later. "Remember that old song we were fond of as younger versions of ourselves 'You're so vain'? I'm of the firm belief that song was written explicitly for Perkins and I will add, no woman is safe around that man." Very much like the lecherous Burns. Jack's confidence was infectious, Anne took that as a sign that she could rest her mind on the matter. "You know me well enough Jack, I'll be doing this still when they're writing my epitaph and then some. Retirement is not in my dictionary, I merely needed to know where and how I could manage this without endless miles of unnecessary paperwork. So there you are, you've given me the will to carry on and I can only say thank you. Besides, that extra little star might just help us get the much needed equipment we've been lacking for years." She had to add just that much more to it. "He does and he wears the foulest aftershave you could imagine Jack." Anne was about to stand when she remembered one last thing. "It's my place for the barbeque this weekend; I had almost forgotten. That is of course if Sam is up to it." "Let me and Hank worry about the politics, but consider this settled." Jack said. "I do have a suggestion, though. Obviously, we can only hold these guys at the gates on this issue for so long. We probably bought a few years, but a couple things I want you to consider. First of all, you really should be grooming your replacement. The next time, I really don't want to be left holding the bag and have to pick someone like Perkins, I'd rather have someone we can endorse fully. You know the requirements and you know a lot of people here. Start working on that, because I'd rather not see your legacy here be torn down the day after your going away party." Jack explained. "Secondly, just because you retire from the military doesn't mean you don't have a place here. There are roles to look at, you know. Don't tell him I said this, but Hank would love if you were to take over representing Australia on the IOA Council. He's got a wishlist for nearly every country but can't get any of them. That's obviously not a right away thing, but take it from me; having a long term plan really helps." Jack shrugged, "Or at least that's what Sam keeps telling me." "Just think about it, and we'll try to make it but I don't know if Sam and the kiddos are up to it yet. Can't hurt to ask, though." Jack concluded. Now that brought a smile to the woman's face without a doubt. "You'll note that letter was dated two weeks ago." More than a smile, a rather large Chesire cat version of the same thing. Anne unpinned the single star from her lapels, fished out the twin stars in their case from her other pocket handing them over to Jack. "I know Ian would love to do this, though considering the circumstances and the pressure he's under, I'd feel honored Jack if you would." But before he could attend to that minor duty she added to his assessment. "It wasn't something I've contemplated of course but you are right as always. The first is another fine Naval officer, one of yours. Captain Victor Zampatti. He's in line for Rear Admiral within the next few months, I've worked with him out of the US Naval Hospital at Beaufort, he is the present Commander there. A fine surgeon with a decent head on his shoulders, easy to work with and the type of man who knows when to keep his mouth shut and when to open it." The second, well to her she would be top of the list but knowing some feelings about foreign staff officers at the SGC (which included the slight degree of hostility Anne received when she first took up the post) the woman on her mind was one of the best. "My next choice is a little closer to home. Brigadier General Margaux Bisset. Royal Canadian Air Force currently Commander of the Eastern Canadian Armed forces medical group out of Montreal. I was her CO when we both worked on the USNS Mercy during Desert Storm and again we worked together in 04 for the Indonesian Tsunami relief operation working out of Darwin Base general hospital. She is possibly one of the world's leading combat trauma surgeons and the type of Medico who knows her way around most of the fields of medicine that can be thrown at you. She is an Orthopedic Surgeon by trade but she is just as handy with Cosmetic surgery as well. So there you have it, two good names in the hat and I can when the time comes approach either of them without too much fuss or raising too many eyebrows." She looked at him as if he'd cracked the best joke in a while yet. "Seriously Jack, you mean it don't you?" That was something worth thinking about in so called retirement. With most of her family here and not likely to head back down under for a few years yet, it was worth thinking about it. "With us both knowing Sam as we do, she'll cover up what she is feeling just to be there. Look, I'll swing by tonight at your place on the pretense that I need to see how the babes are doing, that'll let me know without any intrusion how well Sam herself is doing." "Well, then you should start working with them, get them warmed up to the idea of moving into the big chair, so to speak. Names that come with endorsements that I know are reliable are the ones I like the best. I can't pick both of them, obviously, but if you can line it up so we have the slot covered for a while with good people, then that's one problem I don't have to worry about." Jack said. "Yes, I'm serious. Everyone on the IOA Council are politicians or politically connected so they don't know how it is here, they just know how to play the political game. And some of them forget that we don't care about their party politics back home." Jack explained, "Probably the only time I'd say I'm glad China is a one party state, they're the only ones who only have one stance all the time..."
"Unless Ian has something else for me, I'm going to probably call it a night. We can check with him real quick and then we can both see Sam and the kiddos." Jack said after checking his watch. "As for those, let's do that tomorrow. We have a lot that's happened today and people are on edge." Jack said, sliding back the insignia. The wheel of life, something Anne's dear old aunt Jean told her about with regularity; life is like a wheel, as it turns there is no beginning and no end, it just keeps rolling along. "I'll be speaking with Victor later this evening in fact so that might prove an opportune time to sound him out as he's passed the first hurdles in any case. As his department had been asked to provide us with some additional staff, he's already gone through the hoops signing the non disclosure agreement over a year ago. Saves me telling him all about creepy alien snakes and the like doesn't it. On a side note, Lieutenant Kubowlski is his son's fiance' and I know she'd like any excuse she could find to be transferred to Atlantis." The hint there was the girl and future father in law weren't exactly the best of buddies since the old man had his son transferred to the military hospital in Landstuhl Germany. "Coincidentally the reason I made that remark about the joke, our PM broached me on the same matter when he was here recently to see your President. I told him I'd think about it and I still am. It'd give me a two way opportunity to do things I'd often not been able to do here on the logistics side of things wouldn't it?" Worth thinking about as far as Anne was concerned. She took back the pins, stuffed them in her pocket knowing surely tomorrow will be a continuation of the turning wheel. "I'll see you later tonight then Jack. Before I leave I'll pop by and see how Ian is doing, I'm still a little anxious not hearing from SG1 at this point, we both know the routine and by now they've missed two scheduled dial ins." 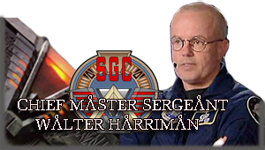 "SG-1 is with SG-7 and -12. I thought I heard Major Rivers check in earlier." Jack said, rocking himself out of the chair. He made his way to the door and opened it, letting Anne take the lead. Anne wasn't satisfied of course, her people, or more rightly those under her care meant everything to her and with this she felt those womanly ways telling her that something wasn't right. She accepted Jack's reply grudgingly without a word, what else could she do? "I'll finish my rounds, check on my Nurses and so forth and I expect I have a stack of emails to go through Jack. Please let me know if you hear anything, anything at all." She left him with that with her turning left to find the nearest elevator. Ian, she could catch up with him later. Ian puled out his cellphone, a bit annoyed that he had left it to ring so loudly. It was a bit unprofessional of him, but he let it go as he dialed Hank back. "Hank. I'm sorry I had to do that, I was in the middle of a briefing, we've got a lot of bad news around here but some good also came in. I take it the Russians are ruining your dinner plans?" Ian asked. "I understand Ian and not I wish it was buddy. Turn on your TV and you'll see. I'll hang on for as long as it takes." "Sir we have SG's 9, 16, 22 and of course 25. I think given what is there we send 9 to P4H-51Y and the other three teams to P6G-12M. The second site we can have two of the long range vehicles ready go within 15 minutes. I'll call the teams down sir." "...this can't be a coincidence. Not at the tactical or strategic level. Hank, this has got to be the work of Ba'al, he's sending us a message. Normally, I'd say let the Japanese deal with this, they've got good shooters in SAT and Self-Defense Forces, but we're gonna have to handle this ourselves. I'll pass this to Ben MacGregor to handle." Ian said. "Hank, we're gonna have a royal mess soon. A Russian agent was the cause of the leak, she's admitted to doing it intentionally because she believes the Trust are back in the game and may have throw in Moscow now. I had a team bail her out, and she came back with one of Ba'al's lieutenants in her head too. The lieutenant has flipped on our boy, guess she's got a family vendetta and he lied to her for about 200 years." Ian let out a frustrated sigh. "I'm fully expecting Moscow to raise absolute hell over this, she broke a lot of rules and the IOA likely will throw her to the wolves when they find out she exposed the Program to a journalist. The problem is that we need whats in her head, both the intel she has and the intel this Adrestia has, because according to them, we've got a lot of high level people and organizations working for Ba'al. And according to Adrestia, the Tok'ra won't vouch for her, there's some bad blood between them. If you want my suggestion, its that I send them to you, find someone who we can trust over there who has enough weight to keep her out of a cell or some black site...and be ready to make some sort of compromise." Ian said. "Admiral, Walter here sir. Lieutenant Nealson of SG-9 has called in sick with the flu, we need to replace him for the current mission and the only person I can find free is Captain Amir who was temporarily assigned to task force Blackbird." "Damned big message Ian. I had a feeling something might happen all too quickly once we found out he was here. By all means put MacGregor on it but make sure he and whatever teams go out there that they are to make no mistake we will not negotiate with terrorists and that include Ba'al. Get it done and as fast as they can, we do not want any possible leaks and I'll find a way to get the press further away. I'm sure my Japanese friend here at the IOA can cook something up and I will speak to him directly, no doubt he's watching this as well." "You know Ian I am beginning to think you don't like me." "Very well then, where is the woman slash symbiote host now? I can stow her in my cabin for a while and have one of our trusted NID agents take care of her in the short term but you know that isn't ideal. Find out what you can and let me know when you're ready to move her. But I will say this, if she turns out as valuable as you claim you might want to consider me telling you in the end to keep her there, stick her on a team or as an advisor. That part I'll leave up to you." Ian hated to ignore Walter, but he knew the man would figure it out quickly. He had an uncanny sense for efficiency and he'd get things done satisfactorily. "I know how the game is played, Hank. I'll have Colonel Ellis get us eyes on the area, and we'll get our teams there as fast as we can. Have the Japanese government lock the area down as much as they can, we'll do what we can to make people think they took care of it later. Fewer questions asked if the public thinks their own government forces handled it and didn't call for outside support inexplicably." Ian said. He was already typing up the e-mail to send to Stephanie McMillan, she'd know what to do from there. "Well, I wish I had more good news there...she, Agent Barrett and Agent Bristow went against Jack's orders and have gone off to rescue one Sabrina Matthews in Monaco. I believe they're on their way back, but the second Jack hears that she left the base, he's going to hit the roof. As such, I've already instructed the SFs to place the lot into house arrest until tomorrow after the IOA council convenes. I hate to say it, Hank, but we're going to have to figure out how to keep her out of Moscow but not cut the Russians out of running an investigation. She broke a lot of rules and she's now playing host to the most unusual Go'auld I've ever heard of, that's a major liability for the SVR. The problem is we don't want them accidentally handing her over to Ba'al, either." "If anything, it's going to be a problem now because now you can add Jack to the list of who wants a piece out of our golden goose before we get any eggs. Between him, Moscow, the Tok'ra and of course, Ba'al, I'm starting to wonder just how we can protect these two from Ba'al and the Trust if they keep making so many friends. What Barrett and Bristow did was reckless and violates the chain of command, they need to be reminded that they don't get to pull the trigger on ops on a whim. We're going to need to put Miss Mathews into protective custody as well." "I've got a few recommendations I'll float tomorrow morning at the meeting. We're gonna have to hope we've got enough goodwill and support to override the Russians and still have something left for putting together policy on dealing with Ba'al."